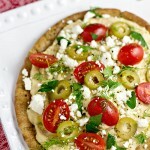 Hummus Pita Pizzas are a quick and easy meatless dinner idea that takes less than 15 minutes to make, with minimal cooking. Preheat oven to 350 degrees F. Brush both sides of pitas lightly with olive oil. Place on large baking sheet. Sprinkle lightly with salt and pepper. Bake in oven for 5-7 minutes or until lightly toasted and beginning to brown. Remove from oven and allow to cool. Spread 1/4 cup hummus on one pita. Top with other toppings. Finish with a light drizzle of olive oil and a sprinkle of salt and pepper, if you wish. Repeat with remaining pitas. Serve whole.